Your vehicle has modules that function similar to your PC at home. They use firmware and software to control operations in your car, from how it starts and the amount of fuel it needs, to emissions controls and even key registration. Your car may require a module replacement at some point, or there may be a glitch in the software that needs attention. Vehicle module reprogramming is often the solution. New Concept Auto Service is your trusted source for module reprogramming in Overland Park. We have cutting-edge computerized equipment for most makes— including GM, Ford, and Chrysler— to accurately perform module reprogramming. 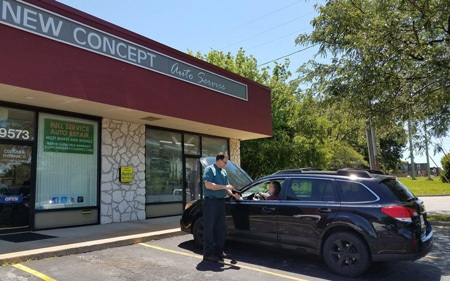 Our knowledgeable staff are thoroughly trained and know how best to address your vehicle’s issues, all the while providing you with service of the highest standard. We have three ASE-certified master technicians, two of whom hold the L-1 certificate for advanced engine performance. You can rest assured that any module reprogramming we perform on your vehicle is done by a highly-trained individual. Whether you need a new key programed for your Dodge Challenger, or tire size calibration for your Ford F-150, we’ve got you covered. Honest. Accurate. New Concept. Call us or use our online appointment form to schedule your car reprogramming today! At New Concept Auto Service, you can rest assured that an ASE-certified technician is working on your car reprogramming. We have the expertise and training to repair any concern that pops up, from fluid leaks to worn out parts. We perform Car Reprogramming on all domestic and import models, regardless of the vehicle’s age. We have the necessary diagnostic tools and the repair technology to efficiently and accurately perform your car reprogramming right the first time. It can be inconvenient trying to coordinate your car reprogramming around your school classes or work, so we work around your schedule to make your visit as hassle-free as possible.